This Christian healing audiobook delves into the negative and downright devastating events that occur in our lives that break our faithful hearts and trample our spirits, but it won’t be man-made wisdom pellets being handed out here. This is a Christian journey to find God in the midst of our sorrow. 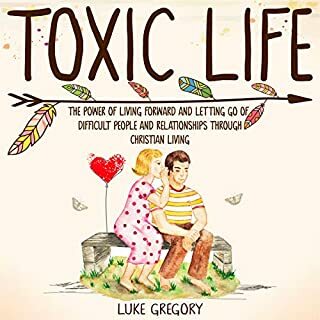 Toxic Life: The Power of Living Forward and Letting Go of Difficult People and Relationships Through Christian Living is written by Luke Gregory. This is an excellent Christian self-help and self-healing audiobook that will help the listener to connect with their faith to persevere through the most trying of times much like Job. Mr. Gregory has written an excellent moving audiobook that can help many people if you are willing to take the chance and open yourself up to Gods will. The narration for this audiobook is provided by Scott R. Smith. Mr. Smith has the perfect voice for this audiobook. He takes the listener from the very first chapter with his engaging voice and brings a sense of the richness of this powerful and moving Christian Healing book. The production quality of this audiobook is also the highest quality. I heard no problems during the entire performance. There were not any detectable flaws that I was able to hear during the entire performance such as loops, breaks, or buzzing. The production was crisp and clear. Lucian Grigore delivered an excellent audiobook production. I highly recommend this audiobook. I was given this free review copy audiobook at my request and have voluntarily left this review. Querida once had a normal life...a self-professed computer nerd and a devout Christian. Everything changes when she moves in with her Satanic stepfather. Inner conflict with her faith and values lead Querida to join forces with her stepfather. Together, they follow a diabolical plan to free Lucifer from his imprisonment in hell. Is Querida's betrayal part of a scheme to assassinate Lucifer...or is she even more evil than the Lord of Darkness? 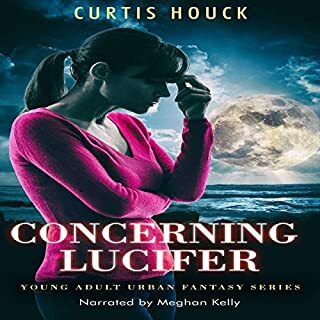 Concerning Lucifer: A Young Adult Urban Fantasy Series written by Curtis Houck tells the story of Querida. The story is set in a world where The worship of Satan appears to be mainstream and equally accepted as Christianity. Querida who now lives with her mother who has remarried a satanic worshiper. She and her brother now live with her mother and new stepfather. The Mother and brother have both converted to Satanism and have seemingly only had good things happen for them afterward. They push their new world view on her daily. She struggles with her faith. All she ever wanted from God was a tangible sign from him that she was being heard. This is the core of the story. The story does hold the listener's attention with Querida’s struggle with her faith in God. Her absentee Father and his reasons for being gone that have never been explained. Querida had a best friend who is questionable in her motivations, during their friendship. This all lends drama that makes the story interesting during the short running time. This short story does end on a cliff hanger which is annoying. There was nothing showing another story coming soon. The narration is provided by Meghan Kelly. Ms. Kelly brought a strong skilled vocal quality to this audio production. The production quality of this audiobook is also the highest quality. I heard no problems during the entire performance. There were not any detectable flaws that I was able to hear during the entire performance such as loops, breaks, or buzzing. The production was crisp and clear. Curtis Houck delivered an excellent audiobook production. 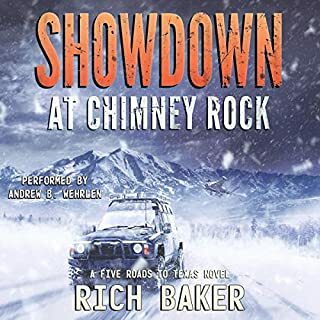 This is an interesting audiobook I would recommend it if you are a fan of the genre but would wait to pick it up when the sequel is out. I was given this free review copy audiobook at my request and have voluntarily left this review. One of the best of the series! Great Story!!! This story is set in the Five Roads to Texas Universe. In this world, a ZomPoc Virus has been released and is wiping out the world. Sarah Washburn, her Father in law, and Leonard escaped from Beaumont Medical Center and have traveled back to the Isolated Colorado high country on the Ute Reservation. While escaping from Beaumont Medical Center, Leonard grabbed a package. This package contained all of Dr. Sanjay’s work on the virus responsible for the zombie apocalypse. Now Sarah’s crew is being perused by Iranian mercenaries. The story holds the listener's attention with action and plenty of danger for the main characters. In this universe, the stories are darker and the good guys do not always win. This makes for some really great listening. This is really a fun universe to explore as a listener. This time around the greater danger for the main characters is other humans. The zombies are still a danger but they don’t wield weapons. This story really opens up the whole world of this universe with its story arc. The narration is provided by Andrew B. Wehrlen. Mr. Wehrlen brings a strong skilled vocal quality to each audio production. His narration of Sarah and the people with her in this story really gets the listener invested in this new addition to the Five Roads World. The production quality of this audiobook is also the highest quality. I heard no problems during the entire performance. There were not any detectable flaws that I was able to hear during the entire performance such as loops, breaks, or buzzing. The production was crisp and clear. 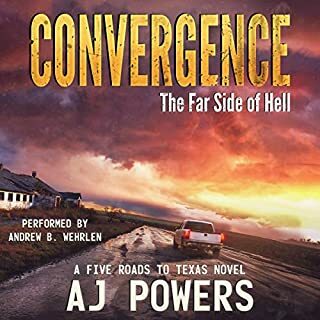 AJ Powers delivered an excellent audiobook production. I highly recommend this audiobook and series. I was given this free review copy audiobook at my request and have voluntarily left this review. This story is set in the Five Roads to Texas Universe. In this world, a ZomPoc Virus has been released and is wiping out the world. This is Malcolm's story. His family took a trip to California for a long weekend before the virus got bad to visit his wife's side of the family and never returned. This was to give him a break from everyone and give him some alone time. Suffering from guilt and grief he plans to end his life after several weeks into the apocalypse. He wants to tour the families favorite places in their home town of Cincinnati while avoiding the infected. He crosses paths with Tessa a surgeon trying to get out of town with her two children. He decides to live and help the escape town before it is bombed by the remnants of the federal government the following day. The story is really enjoyable and holds the listener's attention. The action is fast past paced and keeps the story moving. In this universe, this is not the happy shiny world where everything is sunshine and rainbows. The stories are darker and the good guys do not always win. This makes for some really great listening. This is really a fun universe to explore as a listener. The narration is provided by Andrew B. Wehrlen. Mr. Wehrlen brings a strong skilled vocal quality to each audio production. His narration of Malcolm in this story really gets the listener invested in his journey in this new horrific world. The production quality of this audiobook is also the highest quality. I heard no problems during the entire performance. There were not any detectable flaws that I was able to hear during the entire performance such as loops, breaks, or buzzing. The production was crisp and clear. AJ Powers delivered an excellent audiobook production. I highly recommend this audiobook and series. I was given this free review copy audiobook at my request and have voluntarily left this review. A True Gem of SciFi Fun and Awesome Dialogue! 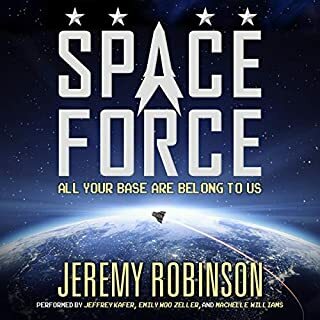 Space Force by Jeremy Robinson is one of those audiobooks where the listener really needs to reads the publisher’s summary. Next, read at least one or two reviews to be sure of what they will be getting themselves into for the next 9 hours and 33 minutes. This is to stop the problem of the one or two delicate flowers that will still go and tear apart the author or narrators with negative reviews because they did not like the content of the audiobook. Sigh on to the review. Space Force became a reality after a President wanted one. Flash Forward 5 years. The Space Force became a home for military problem children the other branches did not want to deal with but could not discharge. The new President and Congress cut funding to the minimum. Then the Aliens show up using their advanced technology, they seal off Space Force Command behind a shrinking force field and kick off a battle royale to the death. Human vs. alien. To the victors goes the Earth. The story holds the listener's attention well if you are a fan of this type genre of inside jokes, mild cursing, Deadpool like humor, and borderline breaking the 4th wall. The story is really funny and it holds up through the entire book. I thought the humor might get old after a while but I was wrong. The writing was on point through the whole story with a really cool part at the very end. Ivan totally rocks! The narration of the audiobook is just plain awesome. There are three narrators, the first is Jeffrey Kafer he narrates the story from the point of view of Captain Ethan Stone. Emily Woo Zeller narrates the point of view of First Lieutenant Jennifer Hale. Machelle Williams is the final narrator but I am not going to spoil which character she narrates as it comes as a really nice surprise. All three narrators do an incredible job on this audiobook. The publisher for this audiobook is Breakneck Media. The production value is of the highest quality. I heard no problems during the entire performance. There were not any detectable flaws that I was able to hear during the entire performance. I did not hear any loops, breaks, or buzzing. The production was crisp and clear. I was given this free review copy audiobook at my request and have voluntarily left this review. 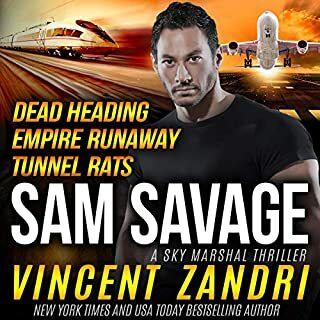 The Sam Savage Sky Marshal Boxed Set: A Sam Savage Sky Marshal Thriller was written by Vincent Zandri. This boxed set contains 3 Sam Savage Sky Marshal Thrillers, Dead-Heading, Empire Runaway, and Tunnel Rats. Each story in this box set is enjoyable for the listener. The first story is a classic airplane hostage situation with Sam Savage just being in the wrong place at the right time as he is Dead Heading as the stories title explains. The second story is Sam Savage doing penance on a rail line for doing his job in the first story. It is another hostage rescue story but on a train. The third and final story in the set in Vietnam and is more of a story using his talents from his military/CIA/contractor days to stop a terrorist group. All the stories do hold the listener’s attention if this action/adventure is a genre they enjoy. The stories are not long. The entire running time for the box set is 5 hours and 28 minutes. This is a good deal if you have been interested in the individual stories. The dialogue is snappy and this has an overall feel of a 1980's action movie franchise set in the current era. Which is a great thing! The narration is provided by Andrew B. Wehrlen. Mr. Wehrlen does an excellent job with this varied cast of characters once again. Each character was given own unique voice and this makes for a really great listening experience. One example of this is the terrorist in the final story Tunnel Rats. Mr. Wehrlen made Channy such a real-life obnoxious character I was ready to see him get killed at some point in the story. The production quality of this audiobook is also the highest quality. I heard no problems during the entire performance. There were not any detectable flaws that I was able to hear during the entire performance such as loops, breaks, or buzzing. The production was crisp and clear. Vincent Zandri delivered an excellent audiobook production. I was given this free review copy audiobook at my request and have voluntarily left this review. 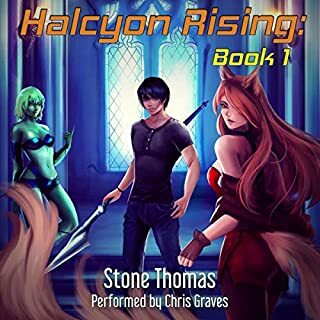 Halcyon Rising: Breaking Ground, Book 1 is written by Stone Thomas with a running time of 5 hours and 20 minutes. Mr. Thomas has written a story in the LITRPG style. The main character is Arden. A young man who is an orphan on his own in the forest until fate crosses his path with a minor goddess in need of saving. Then offered a chance to be her head priest he takes it and becomes a skill miester unlocking peoples skills to level them up. He needs to recruit people to help protect Nola his goddess and build her city. He meets Vix as a bestkin builder, Cindra a negotitrix made of slime, and Mamba a half-elf gypsy snake charmer. The story holds the listener's attention while balancing the different threads of world building. The harem aspect is part of the story but the city building is and character enhancement plays a much larger part of the story. The narration by Chris Graves was simply amazing in this fun new series. Mr. Graves gave another excellent vocal performance. Mr. Graves gave voices to the characters that were very memorable, especially Cindra with her smooth smoky alluring voice. When seeing Mr. Graves name attached to an audiobook I will now give the book a listen. Once again he did not disappoint his performances are consistently excellent. The publisher for this audiobook is Stone Thomas Productions. The production value is of the highest quality. I heard no problems during the entire performance. There were not any detectable flaws that I was able to hear during the entire performance. I did not hear any loops, breaks, or buzzing. The production was crisp and clear. I was given this free review copy audiobook at my request and have voluntarily left this review. 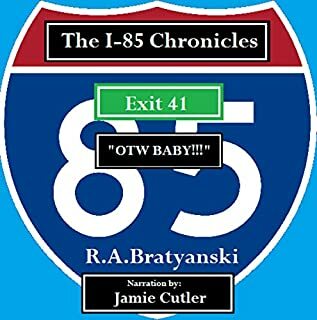 The I-85 Chronicles: Exit 41 "OTW BABY!” is written by R.A.Bratyanski. The narration is provided by Jamie Cutler. Total running time is 3 hours and 34 minutes. During that time the listener will hear what is the first installment in the author's new post-apocalyptic series. The story is familiar for the genre having an EMP event then following the parallel story tracks of the main character of the husband Beau as he struggles to get home the 30 miles and the wife who struggles to get home in the city they live in. The story does hold the listener's attention. The author’s unique approach to the story having Beau not being a prepper having everything he needed before the event. Beau is also not in great physical shape. He has made morally questionable choices along the way to get home. Choices that could have long term effects on the city he is leaving behind. The author is doing a fun approach to this story with each edition a new exit off of I-85. By breaking the story up into short pieces to keep it fresh and ongoing as compared to one large story that dies on the vine with no resolution. The narration by Jamie Cutler was very enjoyable. This is the first time that I have heard an audio performance from Mr. Cutler but he did an outstanding job on this production. His style an unvoiced reading style that is really suited to his rich deep voice. Those unfamiliar with the term unvoiced reading style, this is the same style employed by another narrator in this genre Kevin Pierce. The production quality of this audiobook is also the highest quality. I heard no problems during the entire performance. There were not any detectable flaws that I was able to hear during the entire performance such as loops, breaks, or buzzing. The production was crisp and clear. Robert Bratyanski delivered an excellent audiobook production. I was given this free review copy audiobook at my request and have voluntarily left this review. Can you Solve a Murder using Virtual Reality Sims? 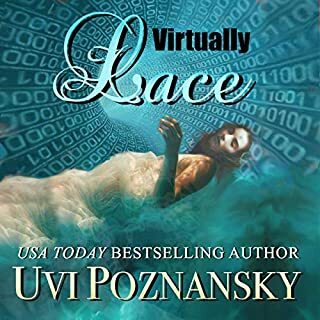 Virtually Lace-Ash Suspense Thrillers with a Dash of Romance, Book 2 written by Uvi Poznansky. The narration is provided by Don Warrick. The total running time is 4 hours and 31 minutes. In that time the listener will join Michael and Ash as Michael is drawn into solving a murder. Using their Virtual Reality Simulation programs Michael sets out to try and solve the murder of a young woman named Lace. This is another story from the author that holds the listener's attention through the entire audiobook. The combination of the mystery to solve the murder with the use of Virtual Reality and Ash putting herself in harm's way to once she learns about the whole story from Michael makes for some really great listening. The love between Ash and Michael is such a big part of the story and how it was affected by her attack and memory loss due to that violent incident. Ms. Poznansky has crafted a gripping cozy mystery that really has the listener paying close attention through the entire production so as to not miss any details of the story. The use of Virtual Reality in the solving of the crime was an excellent part of the story. The narration provided by Don Warrick was very good. Mr. Warrick always delivers consistent and high-quality performance. The production quality of this audiobook is also the highest quality. I heard no problems during the entire performance. There were not any detectable flaws that I was able to hear during the entire performance such as loops, breaks, or buzzing. The production was crisp and clear. Uvi Poznansky was the publisher of the audiobook and delivered an excellent audiobook production. I was given this free review copy audiobook at my request and have voluntarily left this review. Half-fae Sam Gollet is no stranger to solitary confinement - being a half-fae working as a vampire enforcer will do that to you. She is also accustomed to solving the crimes within the supernatural community inside the Illinois Mystical Reservation when the feds refuse to lift a finger. After being released from Solitary, she finds herself quickly embroiled in the mysterious deaths of leading members of the fae community. Despite having been ostracized by the fae community, Sam agrees to solve the murders at the risk of her own safety. Misguided Allies-The Void Series, Book 2 written by Charissa Dufour. The narration is provided by Janelle Tedesco. The total running time is 6 hours and 7 minutes. During that time the listener will be taken back to the world created by Ms. Dufour. The story picks up after some time has passed for Sam. She is just released for Solitary in the middle of the night. She is now firmly in place as Heywood’s enforcer due to his blackmailing of her. The blackmail has cost her everything, friends, family, and total rejection by the Fae community. The story really holds the listener's attention when the fae community begins to lose leading members to what appears to be mysterious deaths that might be vampire murders. Sam is asked to look into them as she previously solved one and no one trusts the FMB to actually care enough to do their jobs on the reservation. Her loyalty is questioned while she does this by the Fae community and the Vampires. This along with drama from the Mages, family, and friends makes for a well rounded very enjoyable story. The narration by Janelle Tedesco is once again truly memorable in this audio performance. Ms. Tedesco this is the second performance that I have heard from Ms. Tedesco. Her narration was consistent across both performances. I greatly enjoyed how she gave each character a unique voice and conveyed the emotions of the characters. The way Sam, when she was near a breaking point, was really something to hear. Then there were the characters that just were pure creepy that Ms. Tedesco just made so really made me want to clean my headphones the way the came through was so realistic. The production quality of this audiobook is also the highest quality. I heard no problems during the entire performance. There were not any detectable flaws that I was able to hear during the entire performance such as loops, breaks, or buzzing. The production was crisp and clear. 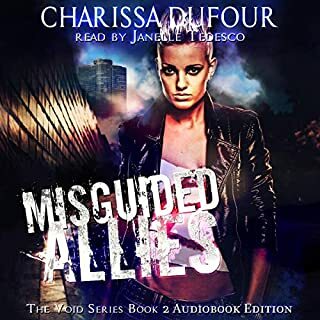 Charissa Dufour delivered an excellent audiobook production. I was given this free review copy audiobook at my request and have voluntarily left this review.